Shakespeare and company is well known — its proximity to Notre Dame brings in a lot of visitors. It is still worth mentioning it in Spotted by Locals, as this is the place where the local English speaking community comes to look for stuff to read they don’t want to buy over the internet. The pleasure of getting in a place stuffed with books from floor to ceiling where every inch of the shelves is used to display novelties or classics with taste and charm is not the same as buying a book on your smartphone. What I most like is that they have those little corners where you can sit and glance through a few books you have selected before you decide which one to buy, and the fact that the place looks like a house, where even the staircase is used to store books. If you follow them on Instagram you even get notified of presentations of books or talks they organize around specific writers or novelties. They now also have a bar next door where you can have coffee or light meals, which makes it even more inviting. 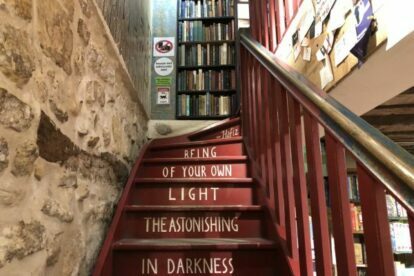 Overall, it is a place where I like to spend an hour or so, walking slowly through the sections, searching for rare things or simply looking at what other people choose and read. It’s an oasis in the middle of the overflowing touristic areas.